Special Note from Eric: I’ve just written an introduction to my new book called Making the Most of the Darkness, and have included the introduction below as today’s message. In it, I share about a quote from a Scottish pastor in the 1600s who saw life differently when Jesus entered into one of his darkest moments. In a way, this is what the whole book is about. The book is only $12.99 on Amazon, but I believe it’s invaluable to someone who is going through their darkest hour. I know I read as much as I could as I was going through this past year just to help me process my feelings, and to help me get out of the circles that kept going around and around in my mind. If you know of someone who is going through some dark times, I hope you’ll consider getting them a copy of this book. They can also read it all online for free from this link, but sometimes it’s easier to read, and more likely to be read, if they’re holding a copy in their hands. I wish there were something more I could do for you, or say to you, that would help to take away your pain or to ease your burden, even just a little. Although it may not seem like much, perhaps saying, “I’m sorry,” is just enough for right now. Sometimes it’s just enough to know that there are other people who care, that there are other people who are aware of your pain and that there are other people who have walked through the darkness as well. I wish I could say I know what you’re going through, but I don’t. And even though no two losses are the same, sometimes it’s nice just to know that other people have walked through the darkness and found something special along the way, something they may have never noticed when they were walking in the light. Stars, for instance, shine brighter when there are no other lights around. On the pages that follow, I’d like to share with you some of the rubies I saw as I walked through my own period of darkness—my first year of grief after losing my precious wife, Lana. I wrote these 12 messages while I was walking through the darkness, not after the fear and danger were gone, which always seems to make things look brighter and more obvious than before. I wrote them in the midst of the pain and heartache that I was experiencing, both as a way to help me stay focused on the One who was walking through it with me, and as a way to give hope to others who were walking through their own times of darkness. At the beginning of my journey, I read a book called Getting to the Other Side of Grief. As I was just getting started, I honestly didn’t know that there was another side of grief and, if there was, if I’d ever get there myself. The pain was just too intense. But the authors of the book had both lost their spouses, they made a compelling case for the fact that there is another side of grief, and if I was willing to work through it—and in my case, to walk through it with God—I could get there, too. I knew this to be true from the previous 26 years of following Him. But I had never had to put it to the test more than in this first year after losing my sweet wife. She was, after Christ Himself, the greatest gift God had ever given me. And losing her was like losing part of myself, too. On the pages that follow, you’ll get to know a little bit more about me and her and my family and our faith in God. Even though we may not have gone through what you’re going through right now, I hope that something of what we’ve gone through will be of help to you. There’s something about walking with others through their pain that helps to ease our own pain, even if just a little bit. 1) When I decided to put these 12 messages into this book, I was even fearful myself to reread them at first. Having just walked through an entire year of grief, I didn’t really want to relive it. Yet as I reread each of the messages, I was surprised at how hopeful I felt after reading each one, and to see that God was indeed walking with me every step of the way—even when I sometimes couldn’t see it for myself. 2) There’s something cathartic about walking through someone else’s pain that brings healing in our own. That’s one of the reasons people love watching good movies so much, even sad ones, because people are able to release some of their own emotions as they watch others go through similar struggles, even if they’re not exactly the same. I remember one night some friends invited me to watch a movie with them when I was stopped for the night at their house on a long trip with the kids. This was before Lana had died, but after I had discovered that she may not live much longer. My friends said the movie was about some guys who bought a zoo and that the kids and I might like it. I had no idea that the movie was about a husband who lost his wife to a serious illness and dealt with the aftermath of that tragic event. As I realized what the movie was about, I started to boil inside, thinking that I would have never watched it if I had known what it was about, and I wouldn’t have had my kids watch it either. I didn’t want to think about Lana dying, let alone what life might be like once she was gone. But somehow I stayed in my seat, for as the movie unfolded, I was drawn into the story, drawn into the way the main characters walked through this loss in their life. Although it wasn’t all peaches and roses, it wasn’t without hope, either. Many of the thoughts and emotions they expressed were the same thoughts and emotions that had flitted through my own mind but never wanted to entertain. Watching now, however, in the context of someone else’s pain, somehow seemed to ease my own. As the movie came to a close, I was so thankful I had watched. It didn’t end all neat and tidy, but it did end with hope. And while the movie itself wasn’t about God, it gave me hope that with God somehow He would be able to work it all out in the end. So perhaps reading our story will give you that hope, too. If you’re just trying to avoid pain, you might be tempted to rush through your grief as fast as possible. But if, on the other hand, your grief is a way to express your last act of love to one who has died, you might rather take as much time as you need to make sure you express it well. There’s no hurry or timetable with grief. But I can say there is another side of it. As I mention in the final chapter of this book, I’m thankful now to be able to see it for myself. “You will grieve, but your grief will turn to joy” (John 16:20b). That may have sounded like an outlandish promise to the disciples at the time, except for the fact that it was Jesus who was saying it—the same Jesus whom they had seen heal the sick, walk on water and raise the dead. If anyone could make a promise like that and live up to it, Jesus could. So with that hope in mind, and with my heartfelt condolences for the loss that you’ve experienced, I invite you to read the 12 messages that follow. I pray that they give you hope for your future—and that they help you to see the stones along the way flash like rubies. P.S. Throughout the book, I’ll be talking more about Lana and our 6 kids. 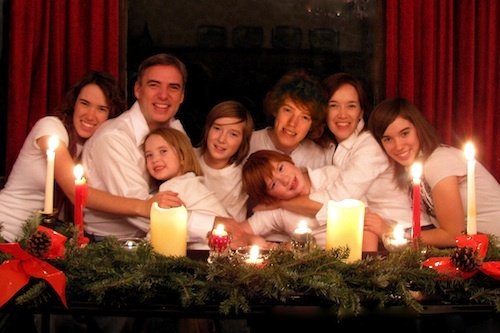 As a way of introduction, here’s one of my favorite pictures of our family, taken at Christmastime in 2009. I’m 2nd from the left and Lana’s 2nd from the right. The kids, from left to right, are Karis, Kaleo, Josiah, Bo (in front), Lucas (in back) and Makari.